The Très Riches Heures du Duc de Berry is one of the most important and beautiful illuminated manuscripts of the 15th century. It is done in the International Gothic style. It is a Book of Hours – prayers, psalms and other texts, usually commissioned by wealthy patrons, as here. Horae, as they were called in Latin, represented abbreviated forms of the Breviary, which contained the texts for Divine Office as celebrated in monastic communities. They were developed to enable lay people to introduce a monastic discipline and element into their private devotions. It contains 206 folios, of which about half are richly illuminated, with expensive pigments and lavish gold leaf. 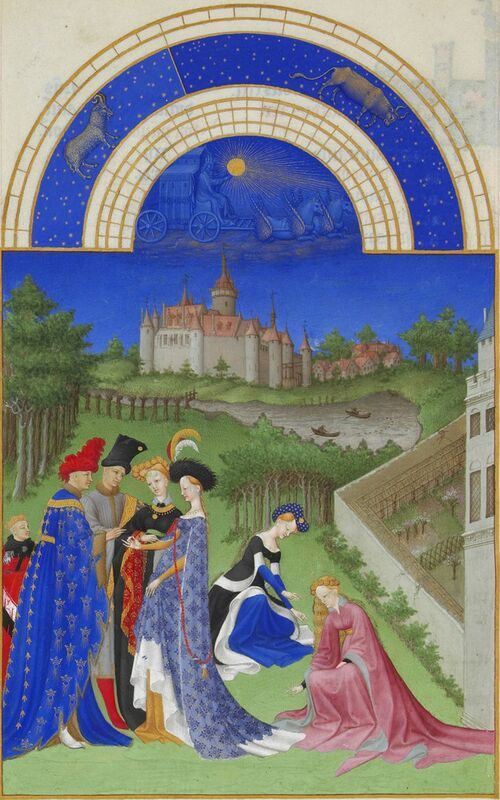 It was painted between 1412 and 1416 by the three Limbourg brothers, originally from Nijmegen in Holland, for their patron Jean, Duc de Berry. They left it unfinished at their (and the Duc’s) death in 1416. Charles I, Duc de Savoie, commissioned another artist to finish the paintings between 1485-1489. It is now MS 65 in the Musée Condé, Chantilly, France. The most famous illuminations are probably those which represent the months in the Calendar, often containing images of the agricultural-rural labours associated with each month, as well as the nobility enjoying leisure pursuits in expensively commissioned examples like Berry’s. A calendar was usually incorporated at the start of the book of hours as a guide to the church feasts and saints’ days, so it was not specific to any year; its purpose was to remind the owner which saint or festival to celebrate on that date. Mary of Egypt, for example, about whom I’ve posted recently, is usually commemorated on April 2. Above each month’s illumination is a hemisphere depicting the heavens, traversed by Phoebus’s solar chariot, with the signs of the zodiac. As today is the last day of April I’ve begun (above) with the illumination for this month. As in many of these images, noble lords and ladies are seen with one of his castles in the background – in this one it’s the château Dourdan, or possibly Pierrefonds – and a walled garden, boats on a pond, and serried rows of trees. Other months depict peasants engaged in seasonal labours. The subjects’ headgear is particularly elaborate, and the fabrics of the cloaks and gowns is sumptuous. To the right what appears to be two attendant women (at any rate they are more simply dressed) stoop to pick wild flowers – a traditional April pastime, and symbolic of the season of hope (not the cruellest month, as Eliot would have it). The central figures are intriguing: the man in the elegant blue robe (the Duke himself? He’s depicted in other illuminations) seems to be exchanging rings with the young lady on the right (perhaps his second wife, Jeanne de Boulogne, who was much younger than him), while another couple witness the scene. Behind them a fifth figure lurks, apparently a young boy. Or is this just a typical scene of betrothal, again representing hope, rebirth and continuity? 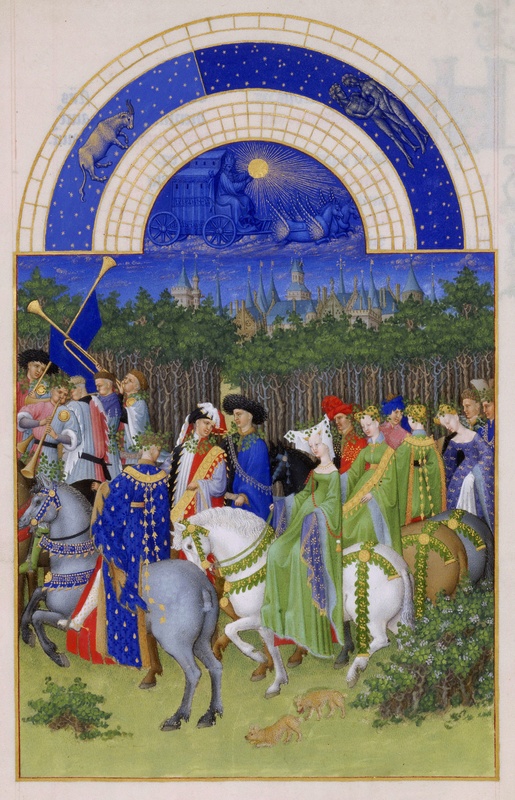 The illumination for May depicts courtiers on horseback, many of them wearing the green garments associated with this pageant, entering (or possibly leaving) the forest in a traditional Mayday cavalcade, wearing foliage to decorate their headgear or as garlands. They are preceded by trumpeters. In the background is probably the Hôtel de Nesle, the Duke’s Paris residence. Small dogs gambol in the foreground. As I write this my friend Mary’s little dog snoozes on the couch beside my desk, grunting and sighing occasionally with sleepy satisfaction. The sun shines amiably outside, and these two beautiful medieval paintings seemed an appropriate way for me to round off April’s posts and usher in those for May. More literary material will follow soon. I hope you all have a peaceful, healthy month of May, and experience the hope and vitality so wonderfully depicted in these images. All images are in the public domain, via Wikimedia Commons. This entry was posted in Medieval and tagged Limbourg brothers, Très Riches Heures du duc de Berry by Simon Lavery. Bookmark the permalink. How lovely to happen upon these images in my blog reader. Very nice post. Thanks, Liz. Glad you liked it.